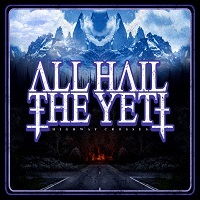 Coming out of the great city of Los Angeles is ALL HAIL THE YETI and their third release “Highway Crosses”. If you are a fan of Pantera, Soulfly, The Sword and Clutch this band will be right up your alley. This band is a cross of Death Metal meets Heavy Metal and a hint of Stoner Metal. I was actually surprised by them I wasn’t sure if I was going to enjoy the album or not and boy was I wrong. With all of the different styles of Metal in this album they became a favorite. The first song “Live Everyday” is a really nice glimpse into the rest of the album. Connors’ vocals are on point and fits this style of Metal really well. The Guitarists Bryan Harrah and Craw NeQuent really meld the band together as a whole. The Second song up “See You Never” is a really great song and you will see why I immediately thought of Max Cavalera and SOULFLY. “Withdrawal Delirium” really gets you in the mood to throw down wherever you are. One thing I really enjoyed was hearing the Bass played by Nick Diltz. I definitely hear a bit of Djent in this song and that made me enjoy it even more. One song that really caught my attention was “Seymour Avenue”. It has what sounds like a 911 call but I couldn’t really make out what was being said. But this song is one of the heaviest on the album. I was definitely banging my head to this one. This song had everything on it from slow parts to heavy and then some really deep chugs. I had to listen to it a few times back to back just so I could move on to the next song. “Necktie Party” was another really aggressive track that also threw in some slower parts. It really reminded me of THE SWORD, if they had a Death Metal vocalist. This entire track is gold and I enjoyed every second of it. The final song “The Nuclear Dust” is my absolute favorite song on the album. They threw all of their styles into this track and that made it absolutely brilliant. I think this is going to be one of the albums when I want heavy but not intense metal to listen to. They did a great job on this album and now I am going to have to go listen to the rest of their discography.